Jack Holder misses the next three Panthers meetings. Team manager Carl Johnson admits Panthers can’t afford to follow one unwanted first with another. The city team tasted defeat at the East of England Arena last Saturday when going down 47-43 to Newcastle. That brought a four-meeting winning run to an end on home shale and Johnson has called for a quick bounce-back as Panthers start a run of three fixtures in as many days by hosting basement Berwick tomorrow (Friday, 7.30pm). The two teams then meet again in a return clash on Saturday night at Shielfield Park (7pm) before Panthers call at Newcastle on Sunday (6.30pm). Berwick have lost all 10 league meetings to date and have already ripped up their team with a quadruple change. Johnson said: “It was obviously a disappointment to see our unbeaten home record disappear last Saturday, but we have to admit we were beaten by the better team on the night. “In an ideal world we would have had a meeting the next day in which to try to bounce back, but we’ve had to wait the best part of a week for that opportunity. “Berwick are obviously going to start picking up wins at some point and we have to do all we can to ensure it is not against us. “It’s a busy spell for us with 11 points up for grabs and we’re going for the lot. Why would we aim for anything less? Berwick’s raft of changes recently saw Australian duo Nick Morris and Jye Etheridge, out-of-retirement David Howe and reserve Lee Payne introduced. Howe is one of a select group of riders to have represented Panthers at all three levels of British speedway. Morris is the Bandits’ new number one, but he’s unavailable tomorrow night so they have turned to British champion – and renowned Alwalton track specialist – Danny King to step in. Panthers are without their number one, Jack Holder, for all three upcoming fixtures as he is involved in a World Under 21 Championship qualifying round in the Italy. 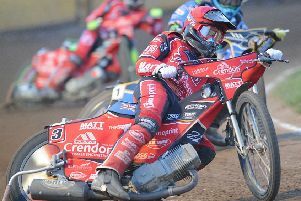 The city club have drafted in a familiar face in current Sheffield man Lasse Bjerre, who has accepted a hat-trick of guest bookings. Panthers are also without high-scoring reserve Bradley Wilson-Dean for the home clash against Berwick due to a fixture clash with his SGB Premiership side, Swindon. In-form Workington man Mason Campton steps in tomorrow before the New Zealand champion returns for the two away trips. But Panthers have been boosted by being able to call on the impressive Paul Starke. He had been set to miss tomorrow and Saturday due to top-flight racing, but was then surprisingly axed by Somerset earlier in the week. Panthers are also set to shuffle their riding order with captain Ulrich Ostergaard reverting to the number five berth, Kenneth Hansen moving to two and Simon Lambert settling in at four. Panthers are currently sixth in the SGB Championship standings – two places and four points outside the play-offs.